Woke up by the sound of a summer storm or a simple rain is not usual for Emiratis. Thanks to an American scientist, Mr. Roelof Bruintjes, this is going to change. 17 years ago he was the one who shut down the request from the UAE government to help the dry country creating the rain saying that in the desert there are no clouds and he cannot do anything about it. Well, in 2016, technology pushes imagination and reality beyond every borders, even beyond nature. Mr Bruintjes’s team initial experimentation includes the cloud-seeding process to lead the innovative program in experimenting with the concept of building a man-made mountain designed to enhance the country’s rainfall thanks to an initial $400,000 in funding and is in its first phase. With millions of dollars in research behind the experiement, Bruintjes and his team in the UAE could push the science into new horizons. But, much like the weather, the long-term forecast is difficult to forecast. The National Centre of Meteorology and Seismology has a total of six pilots and six Beechcraft King Air c90 aircrafts for the cloud-seeding projects, which are used in conjunction with weather radars. The process involves flying into the base of five to six targeted clouds and then the plane’s flares release potassium chloride, sodium chloride and magnesium into the clouds. Potassium and sodium allow water vapor in the clouds to form droplets heavy enough to fall as rain, usually 20 minutes later. The amount of rainfall depends on the size of the clouds and air pressure. Already this year, 75 cloud-seeding operations have taken place – almost four times more than during the same period in 2015. Last year, a total of 186 missions were sent to seed clouds in the UAE, with each aircraft taking about three hours to target five to six clouds at a cost of $3,000 per operation. On March 9, 287 millimeters of rainfall was recorded in 24 hours in an area between Dubai and Al Ain, the highest level since official records began in 1977. Ever since its creation, cloud-seeding has been controversial. Though the science behind it seems almost magical, the technique is far from natural and can be almost uncomfortable for some to know the rain pouring over them was at least somewhat aided by man. However, no negative consequences have been shown to be associated with cloud-seeding. Silver iodide, used to seed clouds, in large amounts can be harmful, but the concentrations found in liquids brought down from seeding are almost undetectable. The pros of gaining natural water unquestionably outweighs the non-existent cons, for now. Whether in summer or winter, moist clouds are not always efficient at producing precipitation even with the help of seeding. 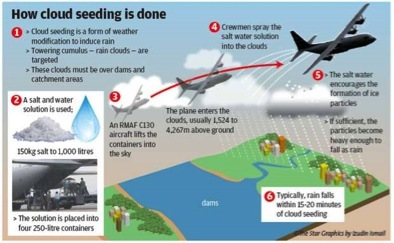 It is also difficult to decisively determine whether a cloud-seeding operation causes rainfall without knowing what would have naturally occurred otherwise. However, despite the lack of consistent and concrete evidence to support its full effectiveness and the uncertainty of knowing just how well it works, many countries continue to heavily invest in the science. 52 countries had active cloud-seeding operations last year, 11 percent more than in 2013, according to the World Meteorological Organization. The largest weather modification system in the world is in China, where there have been some drastic effects. In February 2009, Beijing claimed its earliest snowfall since 1987, thanks to cloud-seeding after a four-month drought. Artificially-induced snow that lasted three days led to the closure of 12 main roads.